You know what soccer club isn’t in crisis this week? Arsenal, that’s what. Arsenal’s noncrisis, its state of not being caught in an irrevocable collapse, is the main talking point from the Gunners’ shock 2-0 home loss to West Ham on Sunday in their first game of the Premier League season. A disappointing result? Yes. Bad? Certainly. The sign of a club hurtling over the cliff’s edge toward the purple tentacles thrashing in the churning sea beneath? Not so fast, says the English soccer media. And of course this is all true. Arsenal’s loss to West Ham is not the end of the world, if only because God prefers subtler ironies, and it isn’t even the end of Arsenal’s season, because math continues to exist and there are 37 more games to play. There’s every chance that the Gunners will knock three past Palace, that the camera will cut to Wenger doing that little celebration where he sort of wobbles both fists in the air while bending backward at the knees, that Alex Oxlade-Chamberlain will slide deliriously over some grass, and that all will be well in North London, pending the eventual 4-0 defeat to Manchester City in May that cements a respectable third-place finish. So Arsenal isn’t in crisis. The thing about not being in crisis, though, is that when you’re really not in crisis, no one has to point it out. The zone in soccer between everything going well and everything collapsing into rococo nightmare is a strange and ambiguous state. The gap of daylight separating you from utter despair becomes a major topic of conversation. Your problems are endlessly discussed, but only in terms of your lingering hope of solving them. The possible survivability of your shortcomings is the prelude to their exhaustive enumeration in bullet-point lists. This is the state in which “questions are being asked,” the state in which players “will be keen to obtain a result.” Managers in this state show up to press conferences with a portable white board and an air of weary self-justification. Owners in this state tent their hands in the stands and gaze out on the pitch as though it were a very long way away. 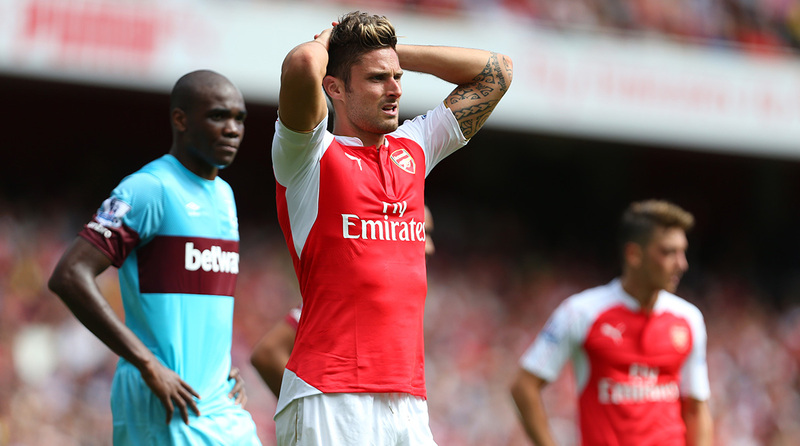 Catherine Ivill – AMA/Getty Images Olivier Giroud during the match between Arsenal and West Ham on August 9. Does any club spend more time not in crisis than Arsenal? You could make the case that not being in crisis has been the club’s default identity since 2007, when Thierry Henry left. Forever being slightly behind in the title race is not a crisis. Suffering through a 3,283-day trophy drought is not a crisis. Finishing either third or fourth for 10 straight seasons is not a crisis. Never quite replacing Patrick Vieira in the defensive midfield is not a crisis. Not signing many big-name players is not a crisis. The slight but detectable erosion of Wenger’s support among fans is not a crisis. How could any of this be a crisis? Arsenal plays in the Champions League every year, sells shirts on every continent, prints money, and boasts a profile almost any club on earth would trade for. It’s just that, somehow, the Gunners have become the kind of very successful club for which the emphasis always seems to fall on the shortcoming rather than the accomplishment — the sort of club for which everything keeps almost going right. I’m not saying this to mock Arsenal (or, OK, not entirely to mock Arsenal). It’s an interesting window into the state of the modern game, where the ambient charisma of a team, the quality of attention it receives, does as much to shape the fan experience as actual results. Soccer seasons are like political debates in that they’re largely about managing expectations. A club that narrowly avoids relegation can leave its fans happier than a club that narrowly misses winning the title. Arsenal is an indisputable power in the biggest league in the world, but its supporters increasingly approach each new season with a kind of comic trepidation. Everything looks so promising; now when will the letdown hit? This is the gallows optimism fostered by perpetual noncrisis. Maybe the worst thing about the West Ham loss, in ambient-charisma terms, was that much of the blame fell on Petr Cech, the legendary goalkeeper whom Arsenal lured away from Chelsea during the summer. Cech isn’t, in theory, the kind of player you associate with urgent assurances that the world isn’t coming to an end. He’s the kind of player you associate with just calmly knowing that the world isn’t coming to an end, because around him it obviously isn’t. He spent 10 seasons as the gangly blue line behind some of the most dominant defenses in Premier League history before being sidelined for Thibaut Courtois last year. Even if you questioned whether Cech had enough left of his prime to justify a £10 million fee, it was easy to see what he was supposed to offer Arsenal. He was solidity. He was a backbone for a club that sometimes took flexibility to the point of spinelessness. He was a quarterstaff and a you shall not pass. And in the preseason, that’s exactly how he looked. Arsenal won two trophies in Cech’s first two starts, and fine, one of those trophies was a gimmick invented by Arsenal itself and the other was the Community Shield, but still; the preseason is a time when the specter of onrushing doom is so far off that you almost can’t hear it whooshing, and it felt like a positive start. The mood at the Emirates for Cech’s debut against West Ham was, if not exactly jubilant, at least not panicky. It’s always when you’re not panicking that doom strikes. Cech wasn’t to blame, of course, for Arsenal’s failure to score. But unless the rumors about Wenger signing Karim Benzema turn out to be true — which, hey, maybe! — Cech will in all likelihood be the Gunners’ most high-profile summer signing. And to have your most high-profile summer signing, the player who is supposed to be the unbreachable wall at your back, tweeting frowny my-bad emoji after his first game — well, it’s a small thing. It’s not a crisis! But it touches on the deep fissure of insecurity at the heart of the contemporary Arsenal experience. 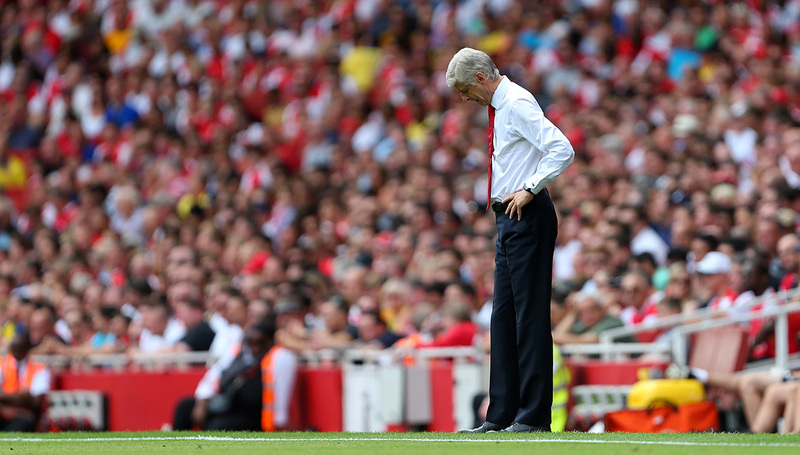 Catherine Ivill – AMA/Getty Images Arsène Wenger during the match between Arsenal and West Ham United on August 9. Again, I’m not saying this to make fun of Arsenal. It’s just that this club sometimes seems to be stricken by the gentlest curse in the history of black magic. And you shall be doomed to do very well indeed, but not quite as well as you would like. The curse is so soft, so basically non-malicious, that a player like Cech seems like a sure bet to break it. Then the whistle blows, and it turns out that instead of freeing the Gunners from their bubble of noncrisis, Cech has been absorbed by the bubble, become the envoy of it. He’s the nonapocalyptic agent bringing about the nonending of the world. He’s been Arsenalized. At least he has for one game. But then, it’s always one game for Arsenal. The problems are never long-term, never insurmountable, never systemic except by virtue of continually following one another. Cech will sort himself out; memorable passages of football will take place at the Emirates over the next nine months; tickets will keep selling for double-take prices; shirts will keep flying off the shelves. But the feeling that something is slightly wrong, that the club is fighting uphill compared to its rivals — not a steep hill, just a slope really, but noticeable, noticeable — won’t be so easy to shake. It will pass on into some other fixable issue, maybe the midfield (doesn’t the midfield need work? ), maybe an injury. Maybe something else. Or maybe it won’t. On paper, even more than in most recent seasons, this Arsenal team seems like one that should be able to push for the title. Chelsea, after all, is currently receding into the event horizon of a full-scale Jose Mourinho ego implosion. Raheem Sterling or no, Manchester City is a defensive question mark. (Is Vincent Kompany still good? Seriously, someone tell me.) We won’t really know about Manchester United till the smoke clears in Louis van Gaal’s laboratory. Who else is there? Liverpool? Hey, good for you for saying so. But even given its thinness at striker, Arsenal should be able to challenge for this thing. It should, right? Someone has to win the title, and magic isn’t real; for Arsenal to do it wouldn’t have to mean improbable, world-melting drama. It would only have to mean that a certain number of variables broke in Arsenal’s favor for once. Things change in sports. It could happen. It really could. Now ask yourself if you believe that it will. I can’t make myself get there, as much as I’d like to. But then, our disbelief is hardly a crisis for Arsenal. For Want of a Time Machine: How Many 2015 National League Rookies Could Have Won the 1999 RoY Award?